One Per Case: Great Odin's Raven! Or "Great Thor's Raven"? How about "Great Norse God's Raven"? Okay, I'll stop now. As promised Thor is what we're about today. In the Ultimate universe, Thor's "secret identity" is Thorlief Golmen, a psychiatric nurse. He only went by this name until just before his 30th birthday when he had a nervous breakdown and started calling himself Thor, the God of Thunder. This nervous breakdown was actually a realization of who he was and what he was doing on Earth. His purpose? To save the world from the "war to end all wars". After this realization, Thor became a very involved environmental and political activist. (Joe called him a "tree hugging hippie"). Thor initially doesn't want to join the Ultimates because he loathes the military aggression the United States is known for and because he is constantly busy with his various causes. When the Hulk starts wreaking havoc in Manhattan, Thor refuses to help unless the President increases funding for foreign aid. Of course he says no initially, but when the Ultimates get destroyed by the Hulk, the President increases the funding at the last second and Thor comes in and saves the day. Depending on what point in time you are in the Ultimate universe, Thor's powers either come from his belt and hammer or from his godhood. Due to manipulation of reality by his brother, Loki, it seemed that Thor's powers are directly derived from his belt and hammer. It was revealed later on that this was a very elaborate manipulation and Thor is granted his full powers back by Odin. The actual source of his power is still somewhat ambiguous, and how much Thor relies on the belt in particular is not specifically revealed. In the manipulated reality, Thor is the test subject of the European Super Soldier program. This was another program designed to try and replicate the success of Captain America. During the testing and application of the suit that "gives" Thor his powers is when he started realizing who he really was. Because of the amount of power needed to supply Thor's abilities, the scientists were baffled about how to maintain the power supply. It was Thor's idea to build it into a hammer, perfectly matching his true personality. As far as Thor's abilities, he's superhuman in every way, speed, strength, durability, stamina, sexiness, etc. His strength alone classifies him as one of strongest people in the world. He's able to lift as much as 100 tons without effort. 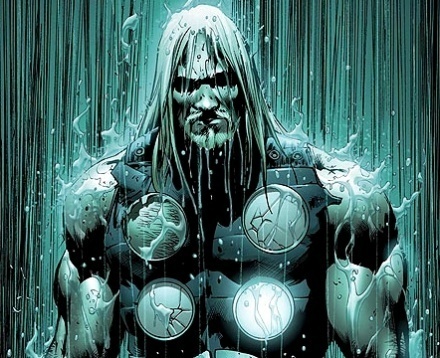 Thor's other main ability is being able to control the weather. The main difference between Ultimate Thor and mainstream Thor is the lack of a human identity. While Thorlief Golmen may not have been using his powers, they were still technically there. Donald Blake, his human name in mainstream comics, was actually human with nothing special about him whatsoever. The other difference is in personality. Ultimate Thor is an environmental and political activist that knows how to fight, but doesn't live for it. Mainstream Thor loves glorious battle and seeks it in every fight he has.